My military veteran friend is excited! Finally, after three years of us working together, his wartime journal notes have been whipped into shape and are now a book. Battlefield Doc: Memoirs of a Korean War Combat Medic already has one excellent Amazon review. I have set up a Goodreads Giveaway and some Kindle e-book freebie days. The Missouri Veterans Home St. Louis staff are planning a book release party for him. I am so pleased to present him with a dream come true as a Veteran’s Day present. Actually, Doc never meant for his journal notes to become a book. They were personal writings, penned in spare moments in primitive battlefront conditions and sometimes terrible weather. I suspect he wrote them to document the craziness that is war, something he discovered shortly after he landed in Korea as a greenhorn. After Doc adjusted to civilian life and got enough feeling back in his frostbitten fingers, he rewrote his notes, some faded from rain or snow. Many years later, his friends read some of them, were impressed, and encouraged him to find a publisher. Through an odd circumstance, he found me and I, too, was impressed by his stories. I don’t commercially publish other people’s work (too much trouble), and the stories needed a lot of editing and organizing, but I agreed to take on this very big project. Doc is a sweetheart of a guy very open to letting me make changes to his writing, and that had a lot to do with my decision. That and no publisher these days would take on this kind of labor-intensive project without charging Doc a ton of money he doesn’t have. Our work together was definitely a labor of love, and I made a wonderful new friend—priceless! Doc tells of deadly serious experiences, but he has such a personable and positive attitude that the book is not a dark tome. His voice shines through. It is like your grandfather sitting back in his rocker and casually telling stories that make your jaw drop. “How do you sleep at night?” I asked him during one of many discussions. “I don’t,” he said. Sadly, that story is a common one among combat veterans. This year is the 65th anniversary of the start of the Korean War. All these years later, Doc still has flashbacks. His final story tells of the after effects of combat duty. Next week, I will write about my experiences with Amazon CreateSpace and with Lightning Source/Ingram Spark—both good, but different. 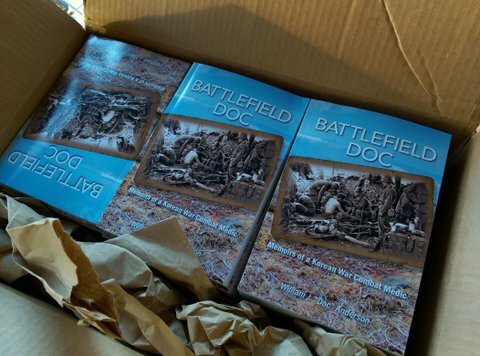 Battlefield Doc is printed through both companies. In the meantime, I am still looking for reviewers. Check out the promotions! This entry was posted in book talk and tagged book talk. Bookmark the permalink.